The Diesel Technology Forum explains why the US is developing microgrids and how diesel generators make them reliable. Microgrids are gaining attention lately. From issues relating to electricity reliability to climate change resiliency, more communities, municipalities and even the Department of Defense have plans to install small electricity generating capabilities. These microgrids quite often incorporate renewable sources of energy, predominantly wind and solar, or both. 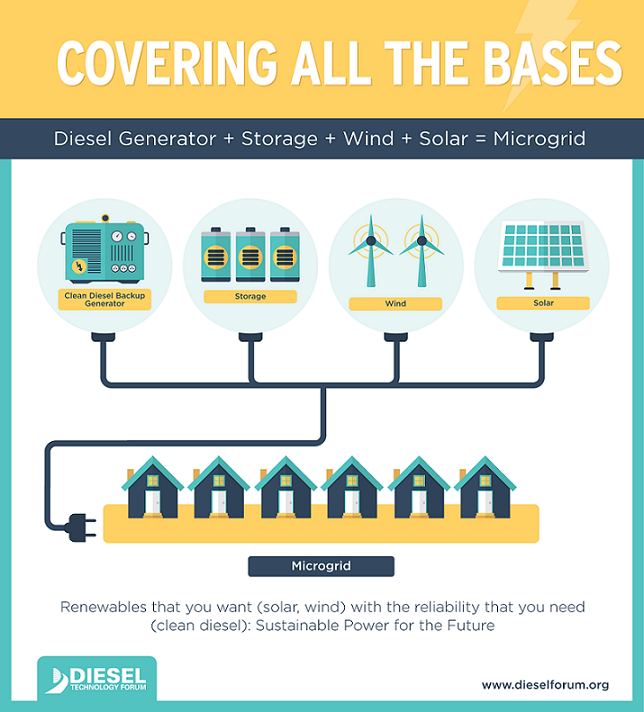 Behind most of these microgrid systems is a vital yet often unnoticed technology – a diesel generator. It should come as no surprise that power outages result in severe economic disruptions. Outages alone are estimated to cost anywhere from $104 billion and $164 billion according to the Electric Power Research Institute. Unfortunately, the number of blackouts has doubled over the last decade. Weather related events that knock out power are estimated to cost between $18 to $33 billion according to the Obama Administration. As severe weather events are predicted to increase, the number of outages related to these events and their economic costs are expected to rise. Superstorm Sandy offers a recent example of the severe consequences of extended periods of electricity supply disruptions. In preparing for the next massive natural disaster, many experts call for the adoption of microgrids that are capable of generating electricity for a small community or neighborhood. Microgrids can be easily repaired in the event of a power outage while providing some excess power to other neighborhoods that may suffer from a power outage. One of the other benefits of microgrid technology remains its capability to adopt renewable sources of electricity generation including wind and solar. Unfortunately, the wind does not blow consistently nor does the sun shine on a predictable timetable across much of the country. Behind most reliable microgrids remains a tried and true technology – a diesel generator – capable of providing electricity when renewables can’t meet demand. This blog and infographic orignally appeared in the Diesel Technology Forum’s Policy Insider. 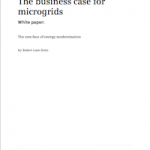 Is My Microgrid Market Forecast Better Than Yours? Interesting to see the contingency plans for power in the US. They might be better thought-out than I would have expected! Diesel generators price in Pakistan are extremely expensive, but Elight Power diesel generators in Pakistan are not only inexpensive, but also a great means to produce alternative source of electricity. it is true that diesel generators are more reliable than any other generators. It sounds good that the department of defense also used diesel generators. I hope in future Diesel generator play an important in developing the economy. Thanks for sharing the information of “Diesel Generator”. I really appreciate it.